Authorized Richway & Fuji Bio Inc.
Orders for the Amethyst Biomat shipping to Australia including Sydney, Melbourne, New South Wales, Brisbane, Perth, Adelaide, Cairnes, Darwin, Canberra, all cities. ** Many products below are now free of import fees and taxes and have lower shipping fee. ex. Biomat Pro shipping is now $60, previously $170. All products ordered from this page are in 220/240v electricity, and are shown in USD currency. If you need 100v (110v) electricity compatible products just send us an email immediately after you order, and note it in the Comments box on the order form. International shipping charges may vary depending on your shipping address. If there is a difference between the shipping charge in the shopping cart and actual cost, we will contact you with the adjusted amount for your approval before your card is actually charged. Contact us via email if you have any questions or to request a shipping quote to your address. You are responsible for any import fees on items without the **. 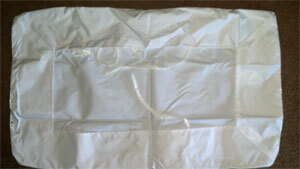 Order securely online or call our Sales Department at 507-Biomat-4u (507-246-6284). We accept Visa, MasterCard, American Express or Discover. You can also pay with Paypal. Your orders are 128bit encrypted for secure and safe transactions with your credit card, or you can pay by check or money order, see our FAQs for details. Each Amethyst Biomat has an Amethyst layer for transferring natural infrared waves, TOCA (Tourmaline) layer for natural negative ions, carbon fiber and copper fabric layers for Electromagnetic interception, peach and grapeseed fiber layer for heat preservation, and 12 other layers. 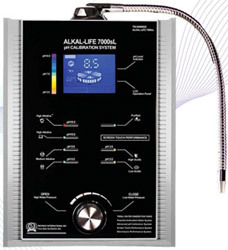 The Biomat Amethyst comes with an advanced IC chip and soft-touch control system, which has many convenient functions. This package comes with a massage-table size biomat (27.56"w x 72.83"h) for all-purpose functionality and ease of mobility. Great tool for massage therapists and chiropractors, it comes with a carry case with shoulder strap for ease to carry the biomat, and 100% cotton padded cover. This is an U.S F.D.A. Approved Class II Medical Device. 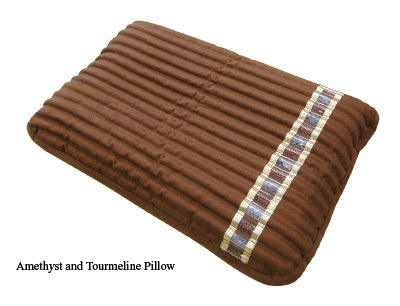 And includes the Biomat Amethyst and Tourmaline Pillow which features a therapeutic shape to provide additional support for your neck while comfortably cradling your head. $100 Professional discount with copy of license. See our FAQs for more information. The Professional Biomat is also available without the pillow. This is the massage-table size biomat (27.56"w x 72.83"h) for all-purpose functionality and ease of mobility. Great tool for massage therapists and chiropractors, it comes with a carry case with shoulder strap for ease to carry the biomat, and 100% cotton padded cover. This is an U.S F.D.A. Approved Class II Medical Device. Measures 19.69"w x 33.46"h. The Biomat Mini contains Amethyst and Tourmaline. Tourmaline naturally gives off Negative Ions, and is a cooling stone. Perfect for Dental, Office, or anywhere a contoured shape is needed. Measures 39.37"w x 78.74"h. Fits nicely on a twin bed. Measures 55.11"w x 78.74"h. Comes with dual control to adjust settings on each side separately. Measures 70.87"w x 78.74"h. Comes with dual control to adjust settings on each side separately. Originally developed for NASA this space-age Elastic memory foam conforms to your head and neck to ensure an anatomically supportive sleep posture. Features a therapeutic shape to provide additional support for your neck while comfortably cradling your head. Keeps your head cool while your body gets hot, and allows the healing properties of the Amethyst crystals to calm and relax your mind. Includes a luxurious velour zip cover for easy cleaning. Considered a must according to Eastern Medicine. Measurements: King: 21.2 lbs / 78.74" x 70.86" x 1.57"; Queen: 17.5 lbs / 78.74" x 59.06" x 1.57"; Single: 11 lbs / 78.74" x 39.37" x 1.57": ** Professional: 10 lbs / 72.83" x 27.56" x 1.57". Bio Mat Quantum Energy Pad composed of environmentally friendly raw materials such as organic compound energy extracted from peach and grape seeds, which is beneficial to the human body's biological vibration. 6 Layer Structure: Microfiber Fabric Cover, Microfiber Layer, Quantum Energy Layer, Liquid Tourmaline Layer, 3D Mesh Layer (20mm), 3D Mesh Cover (3mm). A specially designed cover utilizing organic compounds from peach and grape seeds, amethyst and tourmaline. Use the comforter with your biomat to enhance the power of negative Ions and Far Infrared rays. We designed the comforter to be light and comfortable allowing you to relax and have a good night's sleep. Comes with 2 pillow covers. "The first week I slept on my biomat, I was waking up after 3-4 hours because I was getting hot. I had the setting at the 2nd green light and 2 blankets, but I wasn't using the pillow. So I took the case off the Amethyst and Tourmaline Pillow and put it under my pillow on top of the biomat, and ever since then I have been getting 6-8 hours of restful and quality sleep each night. The Amethyst and Tourmaline Pillow is a must. I won't sleep without it." Fill out our ISA (Independent Sales Agreement), and receive Distributor Kit which contains everything you need to start selling the BioMat including several brocures, order forms, and information material. Also gives you 1 Business Center (if you have not ordered a BioMat). If you have any questions when filling out the agreement, feel free to contact me. If you don't have a sponsor I would be happy to be your sponsor and help you along the way, just enter my name, Steve Mullen, in the sponsor field when filling out the agreement. Click here for other countries: U.S., Canada, International Orders for countries not listed, Hong Kong, China, Asia, Indonesia, United Kingdom and all countries that are member states of the EU zone 1, Austria, Spain, Greece, Sweden, Germany, South America (Argentina, Brazil, Venezuela, Peru), Guam, US Virgin Islands, Alaska, Puerto Rico, Mexico. See our Shipping Information page for more information. *Legal Disclaimer. 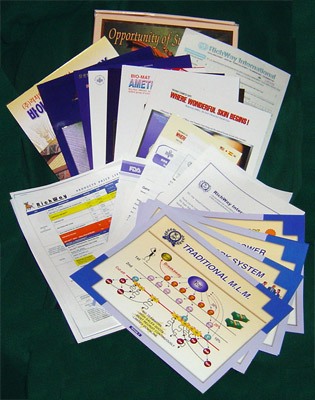 Information provided is for informational purposes only and is not a substitute for professional medical advice. No health claims for these products have been evaluated by the United States Food and Drug Administration (FDA), nor has the FDA approved these products to diagnose, cure, or prevent disease. Since every individual is unique, you may wish to consult with your health care practitioner about the use of our product in your particular situation. The information on this site has been complied by presenting material (taken out of context) from the research study of the records of doctors: Dr. Takada Maku, Dr. Hatashita Toshiuki, Dr. Hirohuchi Mitchio, and Dr. Ota Nobuoi of Toho University Hospital Japan. These research records were developed over a 40 year period of time. Bibliography: Dr. Sang Whang 'Reverse Aging', MD., Ted Rozema 'Chelaton Therapy', and Dr. Fred Soyka with Alan Edmonds 'The Ion Effect'.